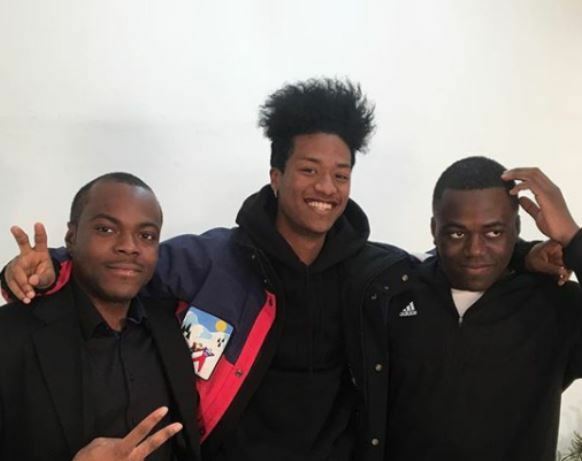 Model Han Hyun-min was pictured with two of the Congo’s “royal brothers.” Nigerian-Korean fashion model Han uploaded the photo to his social media account last Saturday. The two brothers have amassed a large following for their YouTube videos about life in Korea. The brothers are sons of Yiombi Thona, who was born king of a little tribe town Kitona in the Democratic Republic of the Congo. Thona arrived in Korea in 2002 after fleeing his country and the family gained a high profile in Korea after featuring in a TV documentary series. Time magazine named Han, 16, as one of the 30 most influential teens of 2017. He debuted at the Seoul Fashion Week in 2016.